Cards Against Humanity but more socket-ey and playable on the big screen with your phone. 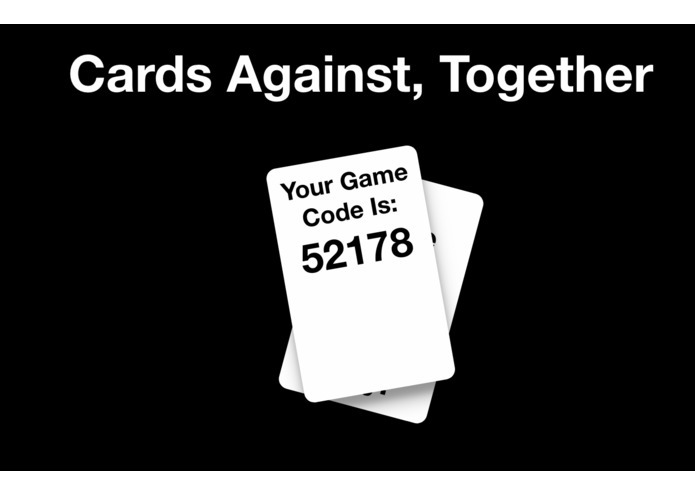 Cards Against, Together really started as a platform and framework choice. We brainstormed for a solid hour, and had not gotten any closer to a product idea. We then turned our focus to a different choice: what we wanted to build our app on and with. This too was a difficult choice, but we eventually agreed on making a game or service that used both phones and computers on one server, communicating through web sockets. We all really liked Kahoot, so we decided on making a party game with one host computer and players connecting to play on their phones. The next question was what the game would actually be, and we decided on a clone of Cards Against Humanity. We all find the game hilarious, and it was one that could realistically be implemented from scratch with the limitations we had. At the moment that we decided what we wanted to make, we started work. The team split into two groups, the content team and the code team. The former started working on the card prompts and responses, as well as a game title, while the latter started the long process of programming this webapp. There were many tests along the way, from the very beginning of designing the difficult server-side event handlers and the socket messages that would trigger them, to the very end of the programming phase by finding a dangerous bug 3 minutes before it was time to share. It was a wild 12-hour-long ride, but I think everyone learned a lot about programming and teamwork. Note: App is live but prone to bugs and instability. Due to the development time limitations, not every situation could be tested. Even if the app is down, the code is always available on GitHub. I designed most of the RPCs between the server and the various clients, integrating with the game rules.